What was to become the Pier Hotel, Seaview, was originally built as a terrace of four houses by Squire William Anthony Glynn of Seagrove Manor in 1892 on the esplanade opposite Seaview Pier. 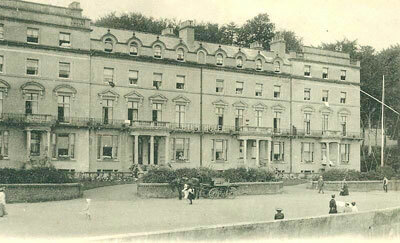 However, by 1901 the individual houses had been combined into the Pier Hotel. Over the years, various extensions were made to add new facilities. During both World Wars, the hotel was requisitioned by the military with typically little respect for the property. After World War 2, the Hotel was auctioned off as one lot with the break-up of the Seagrove Estate. It continued as the ‘Pier Hote’l until the late 1960’s when it changed hands and was re-named ‘The Halland’. Some upgrading of facilities were made and a night-club added. A road was constructed behind the hotel - prior to this new road, access to the houses facing Seagrove Bay was by passing in front of the hotel and vehicles would often park in front of the hotel to give their occupants a fine view of the Solent. But the old building just wasn’t suitable as a modern English, sea-side hotel and in 1973 it was demolished with great talk of replacing it with a modern, luxury hotel. Over the years, the area remained derelict and changed ownership a number of times, eventually the site was developed as housing.